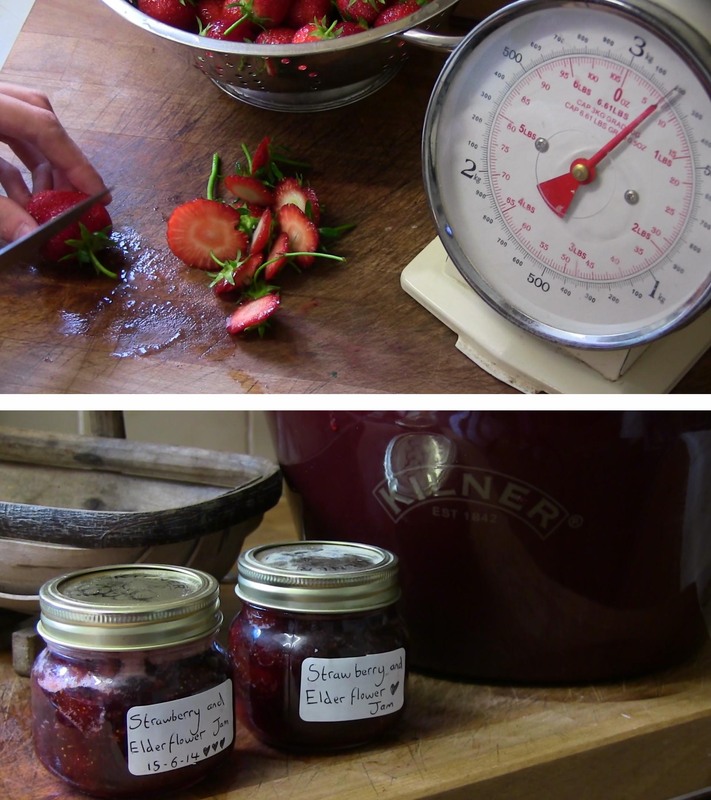 Now I’ve made jam a few times and along the way I have collected some equipment like a large enamel jam pan, a thermometer, various funnels and lots of jam jars. The only problem I have is getting the right setting point, I’ve found that if I don’t rush and take my time to do the wrinkle test at different times during the making process then I can’t miss it! Prep and cooking time; 45 minutes. Put the strawberries and apple in a saucepan or jam pan, add the sugar and stir it up. Heat the pan on low until the fruits start to get juicy and the sugar becomes wet. Add the elderflower cordial. Now turn up the heat to medium until it becomes a rolling boil, do not stir from this point on. Set the timer for 15 minutes. Turn off the heat after 15 minutes and test a teaspoon on a cold saucer for the wrinkle test (Let the jam cool and then move your finger through the centre of the jam, if it wrinkles and leaves a track then the jam has set and it is ready) Let the jam cool down and then stir in the lemon juice. Transfer to a jam jar and allow to cool in a dark place. Once opened keep refrigerated. We’re picking 20-30 strawberries every couple of days from our allotment but my children are gobbling them up before we even leave the plot! I’m hoping that at some point we will have more or they will get fed up of eating them, as I’d love to try making some jam. 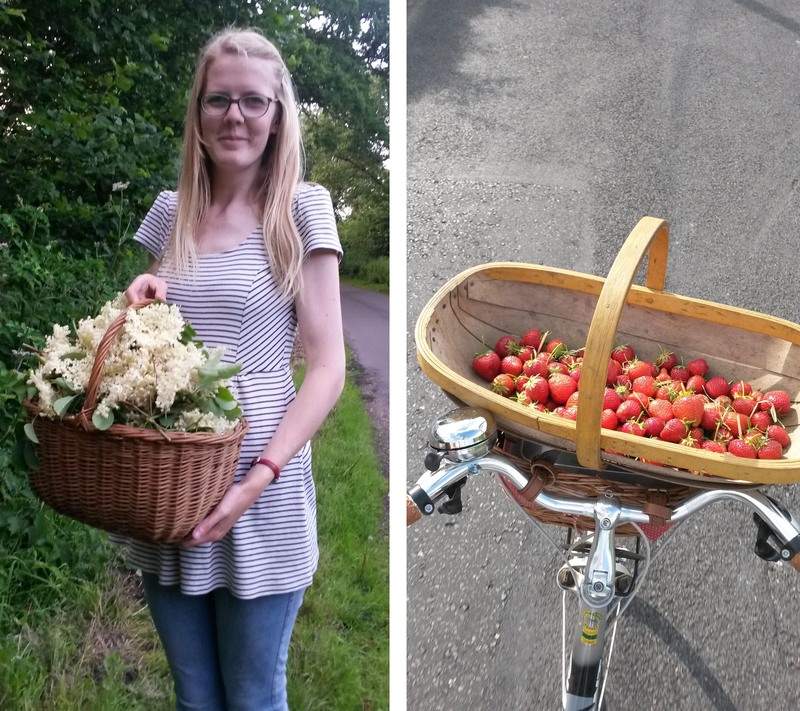 Your strawberry and elderflower recipe sounds delicious. 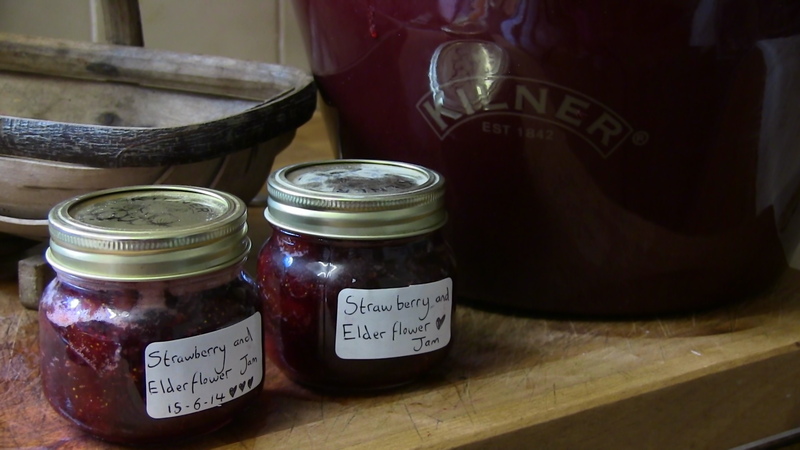 Love your jam recipe. I don’t have the space in my garden veg plot for strawberries (and the chooks would get to them somehow anyway, sneaky birds that they are!) but while I still have some elderflower cordial left (it doesn’t last long even though I make a good gallon or so!) I must go strawberry picking and make some. Oh I would love to have chickens but the allotment rules won’t let us. You could always go vertical with growing them? Thats the best thing about this time of year, you can always find punnets of english strawberries for as little as £1.00 to make jam with. I’m tempted to buy some to make more jam with because at the rate I’m eating the jam now there won’t be any left for winter use!